When blood products are ordered to be administered to a patient who requires transfusion, a series of tests are performed to decrease the risk of an immune-mediated hemolytic reaction caused by incompatible blood. The crossmatch is routinely used as the final step of pretransfusion compatibility testing. It serves two purposes: (1) to serve as a final check of ABO compatibility between donor red blood cells (RBCs) and patient plasma or serum and (2) to detect clinically significant antibodies that may have been missed by the antibody screening test. An immediate spin phase is performed with donor RBCs prepared as a 2%-5% suspension in normal saline or ethylenediaminetetraacetic acid (EDTA) saline and the patient's serum. When the immediate spin phase is positive for agglutination or hemolysis, further testing is required. The donor unit is deemed incompatible for transfusion, and the antibody responsible for the reaction should be identified. The next phase of testing consists of the antiglobulin crossmatch, which may be performed via column agglutination, solid-phase systems, or tube. The antiglobulin crossmatch is the major component of a full serologic crossmatch. Gel testing. Agglutination is graded on a scale from 0 to 4+. A: 4+ reaction = red blood cell agglutinates (RBCAs) remain at the top of the gel. B: 3+ reaction = RBCAs remain in the top half of the column. C: 2+ reaction = RBCAs are scattered throughout the column. D: 1+ reaction = RBCAs are primarily in the lower half of column. E: 0 = no agglutination and red blood cells pass all the way to the bottom. In an antiglobulin crossmatch performed using the column agglutination system, the donor RBCs, suspended in a hypotonic buffered saline solution, are mixed with the recipient’s serum or plasma to allow antigen-antibody interaction in the upper chamber of the microtube. The antibody in the recipient’s serum or plasma is detected when the sensitized donor RBCs react with the anti–immunoglobulin G (IgG) in the microtube during centrifugation. Agglutination or hemolysis constitutes incompatibility between the donor RBC unit and the recipient’s serum. 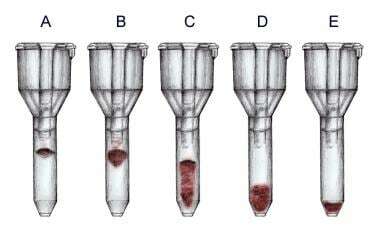 As shown in the image above (gel testing), the migration of donor RBCs through the tube is graded between 0 (representing no agglutination) to 4+ (the maximum amount of agglutination). Before performing tube testing, it is advantageous to wash and resuspend donor RBCs in 2%-5% saline to remove small fibrin clots and some cold agglutinins. The ratio of patient plasma or serum to donor RBCs is also important, as too many donor RBCs could result in a false-negative result if there are not enough antibodies binding to the RBCs to cause a reaction. The patient's plasma or serum must not have current clinically significant antibodies or a history of clinically significant antibodies found via antibody detection test. The patient's ABO blood group must be typed twice. The computer system must be US Food and Drug Administration (FDA) approved and validated on site. It must contain the unit number, component name, ABO group/Rh type and the recipient's ABO group/Rh type, and antibody screen results. The system must be able to alert the user to ABO/Rh–incompatible blood and must not issue the donor unit until its ABO/Rh is verified. The tests performed during the crossmatch vary depending on the results of the antibody screening test and patient history. A full serologic crossmatch is required in patients with a history of clinically significant antibodies found with previous testing or found in the current blood sample. The crossmatch may be performed with either computer or serology. See also the Methods section in Antibody Screening. What are the clinical indications for crossmatching blood? What is needed to perform serologic crossmatching? How is serologic crossmatching performed? What causes agglutination during the immediate spin phase of crossmatching? What is an antiglobulin crossmatch test? What causes incompatibility results on an antiglobulin crossmatch test? What are the criteria for performing computer crossmatching? What are the limitations of crossmatching? Which tests are performed during crossmatching? How does a pregnancy or history of transfusion affect crossmatching? What is the role of crossmatching in the emergency department (ED)? Petrides M. Pretransfusion compatibility testing. Petrides M, Stack G, eds. Practical Guide to Transfusion Medicine. 2nd ed. Bethesda, Md: American Association of Blood Banks; 2007. 38-40. Dzieczkowski JS, Tiberghien P, Anderson KC. Transfusion biology and therapy. In: Jameson JL, Fauci AS, Kasper DL, Hauser SL, Longo DL, Loscalzo J, eds. Harrison's Principles of Internal Medicine. 20th ed. New York, NY: McGraw Hill Professional; 2018. ch 109. Downes KA, Shulman IA. Pretransfusion testing. Roback JD, Combs MR, Grossman BJ, Hillyer CD, eds. Technical Manual. 16th ed. Bethesda, Md: American Association of Blood Banks; 2008. 437-63. Cooling L, Downs T. Immunohematology. In: McPherson RA, Pincus MR, eds. Henry's Clinical Diagnosis and Management by Laboratory Methods. 23rd ed. St Louis, MO: Elsevier Health Sciences; 2017. ch 35. Boral LI, Henry JB. The type and screen: a safe alternative and supplement in selected surgical procedures. Transfusion. 1977 Mar-Apr. 17(2):163-8. [Medline]. Howard PR. Compatibility testing. Basic & Applied Concepts of Blood Banking and Transfusion Practices. 4th ed. St Louis, MO: Elsevier Health Sciences; 2017. ch 9. Cochran JB, Panzarino VM, Maes LY, Tecklenburg FW. Pneumococcus-induced T-antigen activation in hemolytic uremic syndrome and anemia. Pediatr Nephrol. 2004 Mar. 19(3):317-21. [Medline].